Wheelchair Casters that light up! Check the caster fork. It should rotate freely without being wobly. A wobly caster fork ususally means the caster stem bearings are worn out or the caster stem bolt is not properly tightened. You may also have debris caught or wrapped around the fork where it meets with the stem bolt. If so, perform a thorough cleaning and re-check. 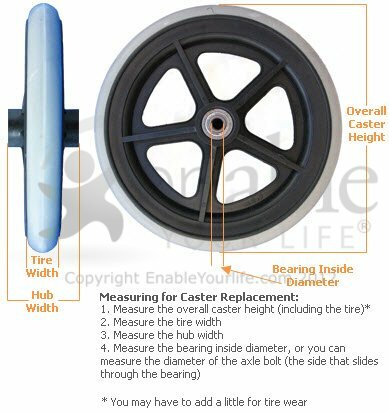 What is the hub width of your caster? Many caster wheel sizes come in several hub widths. The hub is the solid part in the center of the caster where the bearings are mounted and the axle slides through. Getting a hub thats too narrow will cause the caster forks to bend in when the axle is tightened and getting a hub that is too wide will casue the caster forks to bend outward or make it hard to mount the caster. Any of these conditions can pose a safety hazard. Axle or bearing size? The diameter of your axle is the inside diameter of the caster bearing. The bearing must be the correct size otherwise your axle will not fit. You only need the inside dimension of the bearing or the axle diamter.